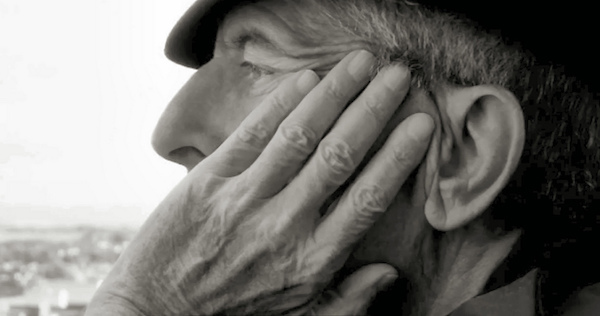 When Leonard Cohen died at 82, he left us more than 100 songs, most of which I don’t know. But there’s one that’s almost universally known and adored: “Hallelujah.” One reason for that success is an effect use of the tools of harmony. That’s a comfortable, homey phrase of music. The melody winds around G, the reassuringly stable dominant pitch. The harmony is also fully domesticated, touching home (I) three times and the dominant (V) twice. We’re 15 seconds in, and all is well. Feel the dangle? That’s a half cadence. 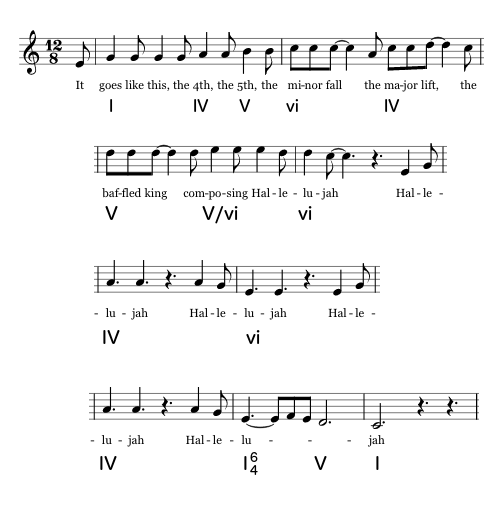 “The 4th” is over a IV chord; “the 5th” is over a V; “minor fall” is a minor triad and “major lift” is a major triad. That’s adorable. Gorgeous. But as usual, it’s the harmony that conveys the main emotional story. We leave home (I) on “It goes like this,” then wander in exile for what is (musically speaking) a very long time. Along the way, we keep encountering LIES. The third chord is a V (on “the 5th”), which promises home…but instead of I , we get pulled sideways to vi, the minor. That’s disconcerting, but okay. Two chords later there’s another V, another promise of home. But the chord after it — the one that looks like a fraction — isn’t even in the key! A minor chord in our home key has been changed into a major chord, becoming a dominant arrow for another key entirely. It’s called a secondary dominant. In this case it’s the dominant of A minor (vi), which leads strongly to vi. Going from V to vi is called a deceptive cadence , for good reason: it’s a damn lie. The first vi was disconcerting. The second, stronger one is more so. Twice we were promised our C major home, and twice we ended up on A minor instead. The second one was even tonicized, which is what you call it when a dominant of its very own was created to emphasize it. The first one takes us home and tucks us into our bed; the second pivots to our dark minor lake cabin in winter, and the firewood is wet, and the horn just blew three times. At this point it’s been a full 30 seconds since we’ve been home, an eternity on this scale. Worse still, we’ve been teased with home three times. Cohen has us feeling subconsciously homesick. Then finally, finally, we get a V that isn’t a lie. It promises home and delivers, moving to a I on the last syllable of the last Hallelujah. It’s an authentic cadence, V-I, the musical equivalent of a period, full stop. Here’s my favorite cover of the song. Feel the security of that first phrase, then leave home, wander in the desert as home is thrice denied, then feel the return on the last Hallelujah of the chorus. Beautiful.